Carl Harry Stålhane unique stoneware sculpture made in the early 1970s for Rörstrand. Signed CM Stålhane, Sweden, 3241 and R for Rörstrand Measure: Height 91cm/35.8?, depth 29cm/11,4", width 40cm/15,7" including base. Stoneware floor vase by Carl-Harry Stålhane for Rörstrand 1950s with brown harefur glaze. Measure: Height 60cm/17.3", diameter 20cm/9.1". Signed R CHS SWEDEN SGB. Stoneware sculpture by Birger Kaipiainen for Rörstrand 1950s. Measures: Height 80cm/31.5", weight 25cm/9.8", depth 12cm/4,7" Signed: Kaipiainen R SWEDEN. Vase in stoneware designed by Carl-Harry Stålhane for Rörstrand, Sweden. 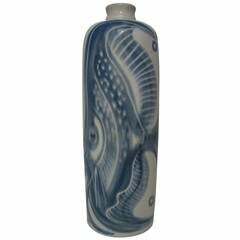 This vase was made in a limited edition. Rare Carl Harry Stalhane glazed stoneware vase for Rörstrand. Free shipping within the United States and Canada.